Every Thursday, I’ll be briefly reviewing a book that I find to be interesting, engaging, and valuable for Agile Faculty. Because the Agile Faculty mindset values exploration, curiosity, and multidisciplinarity, these resources will come from a variety of different areas that speak to a wide range of interests, including higher education, faculty development, Agile and Scrum, design thinking and creativity studies, and social innovation. And I’ll throw in a little bonus review of a piece of fiction or non-fiction I’m reading just for fun. 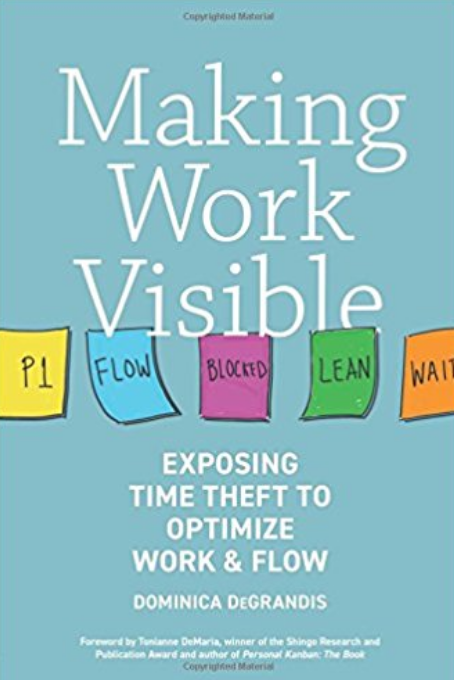 I was interested to read Dominica Degrandis‘ Making Work Visible: Exposing Time Theft to Optimize Work & Flow for a few reasons. First, who doesn’t want to better understand “time theft” and how to manage it? Even though this book is written for a software professional audience, the five area of time theft she articulates – too much work in progress, unknown dependencies, unplanned work, conflicting priorities, and neglected work – are relevant to all of us in our own contexts and especially in higher ed. But I was most looking forward to better understanding kanban within an Agile context. Kanban and its connection to Lean and Agile have always been a bit confusing to me. The tenets of Lean come from the just-in-time manufacturing process perfected at Toyota as a way to maximize value and minimize waste in the production system. “Kanban” is Japanese for “signboard” and was/is used at Toyota as a way to visualize the system, identify problems, and determine how to maximize system throughput. But that’s all manufacturing. Software, and any knowledge work for that matter, does not work on Industrial Revolution or TPS paradigms. I’ve heard of kanban in Agile circles. It seems easy enough, basically a Lean version of Scrum without the sprints. Limiting work in progress is the constraint rather than time boxes. 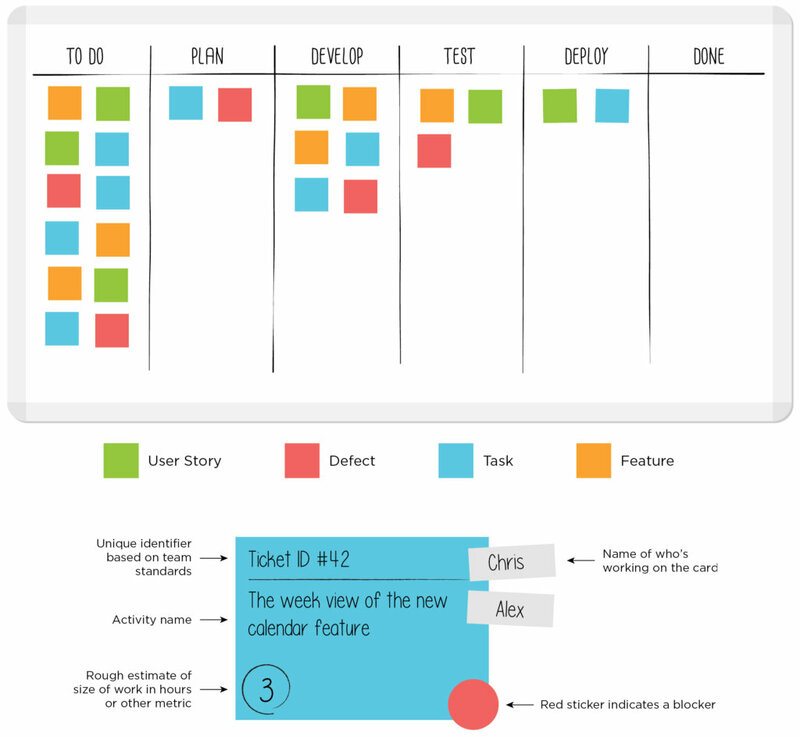 Visualization and limiting “waste” are two of the core tenets – a kanban board is like a Scrum board but with more “swim lanes” depending on how the team uses it (the image to the left is a sample board from software company LeanKit). Yet, I’ve been to major Agile professional conferences where vendors of Lean and kanban programs are basically yelling “Lean is NOT Agile! Kanban is not Agile!” to anyone who will listen (I had to wonder why they were at an international Agile conference if they were NOT Agile…). Anyway, DeGrandis’ version of kanban lines up with my understanding of it as a sister to Agile and Lean. I appreciated how easy to read this book is and the fun doodles and drawings that illustrate the concepts and types of kanban boards. While it is an easy read, it is written for an audience who understands software development, so if terms like “technical debt,” “feature-driven development,” and “throughput” don’t really mean anything to you, you’ll want to skim through a good chunk of her examples. But there is still a lot academics can learn from this text. I appreciated her discussion of how to identify the five time thieves. The way she talks about the time thieves is technical but easy to connect to faculty life – having too much work in progress and constantly reacting to unplanned work are certainly part of our everyday lives. She offers some ways to rethink how these time thieves impact our work. For example, she talks about the Backlog column on a Scrum/kanban board as really a list of options, things that could be done or might be valuable. She argues that once a ticket crosses the “line of commitment,” the line between Backlog and WIP, it becomes a commitment that must be kept. I like this idea of the backlog as a set of options. Dr. Katie Linder told me on Twitter that she used the term “on deck” instead of “backlog” when she set up her board because backlog felt so final and intimidating. I’ve always thought of the backlog as a set of possibilities, so both DeGrandis and Linder’s adaptations make good sense. I also pulled two quotes that particularly resonated with me. First, “Busy people, however, do not signal productivity – delivered value does” (p. 39). She’s talking about this in the context of the fallacy that you can schedule people to “100% capacity” and expect 100% of work to be completed. Humans are not robots to be 100% utilized, so shifting the focus from time utilization to value delivery changes how we think about work. Faculty are always busy, but are we always producing value? Are there better ways to use our time and create value, whatever that means to us? Something to ponder. I also liked the quote, “Beware the lack of good rules for prioritization – remember, when everything is priority 1, nothing is priority 1” (p. 101). As faculty, we often spend a lot of time reacting to unexpected requests and unplanned work as well as a lot of time waiting for something from others to whom our needs are not priority. Yes, we all need to have our own personal way to prioritize requests for our time effectively, but I also think this is a bigger conversation we need to have in higher ed. From a kanban perspective, there is a lot of waste in the systems of higher ed – I know that’s a major can of worms, but using a kanban mindset, looking for areas of waste that we can play with and adapt one at a time through little experiments could be a good way of approaching some of the change we know needs to happen but that seem to big to deal with. So overall, I appreciated this book and think it’s worth a read if you are interested in other versions of Agile approaches to work management and comfortable with some technical language that might need to be interpreted (there is a glossary!). 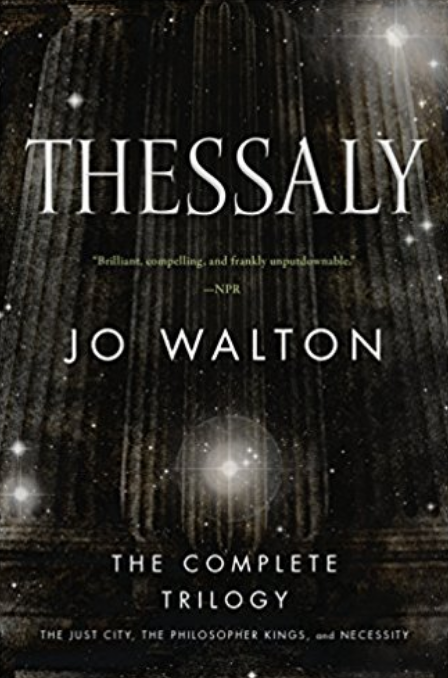 I recently finished Jo Walton’s Thessaly trilogy – The Just City, The Philosopher Kings, and Necessity – and recommend the series highly. The initial premise is that Athena decides to set up Plato’s Republic. She takes people out of time who have prayed to her about Plato, sticks them on the island of Atlantis before the volcano goes off, gives them some robots to build things, and helps them bring thousands of ten year olds to start the city. Apollo is intrigued by the premise and incarnates so that he can better understand humans, excellence, and “equal significance.” The series is philosophically rich and engaging, the fantasy elements realistic, and the sci-fi parts a unique twist (it was published by Tor, after all).